Minutes To Disney, Private Pool, Discounted Rates, Free Resort Amenities!! Beautiful 5 bedroom 4 bath townhome that has enough space for the whole family. 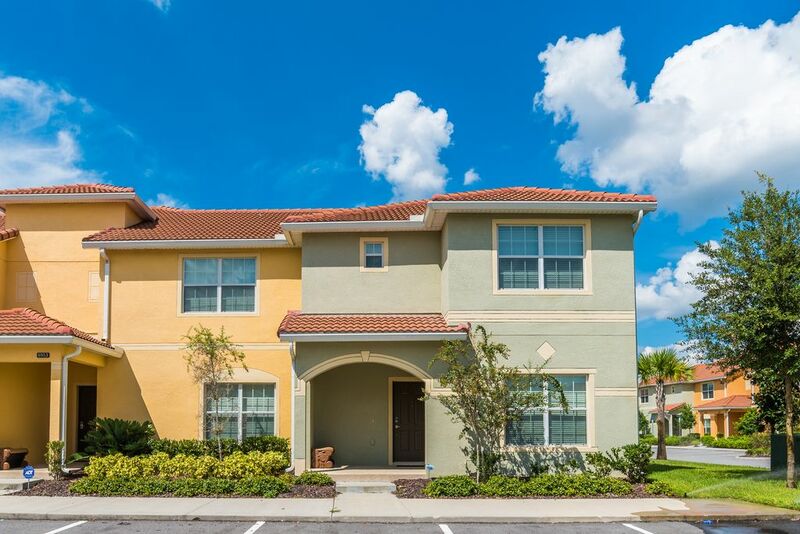 This property is located in the spectacular Paradise Palms Resort located in Kissimmee Florida. You are a short drive to all of Orlando's amazing attractions, and only a few miles from the main entrance to Walt Disney World. The townhome offers a large kitchen perfect for the chef in your group. They will enjoy granite counter tops, custom cabinetry, and beautiful stainless steel appliances. There is a dining room and bar in the kitchen which allows enough seating for the whole family. The living room has enough space for the whole family to hangout and chat about the amazing day they just had exploring Orlando. Step right out back to enjoy your own private splash pool! The property features 5 amazing bedrooms. There are flat screen TV's in each bedrooms to allow for comfort while un-winding at night. You have 2 full size bedrooms, 2 rooms with a full bed and a bunk bed, and a bedroom with a full bed and a twin bed. Enough space for the whole family! Head over to the clubhouse and catch a movie in the theater or spend a day relaxing by the 5,000 sq. ft. tropical lagoon pool with a water slide. The Tiki Bar serves food and adult beverages and adult beverages. The kids will love the virgin frozen drinks, water slide and splash pad. Don't forget coins for the arcade. And when you are ready, the fitness center is waiting for you! There is a lighted tennis court, basketball courts, playground, and a volley ball court for guests to enjoy. Theme parks? Nearby! The resort is minutes from Walt Disney World and within easy access to I-4 which leads to all of Orlando's other attractions. Be sure to inquire with any additional amenity questions. You are a short drive to Disney World and all other Orlando attractions.